This is the 2016, 12 month wall calendar with animated art images inspired by the Despicable Me and Minions movies. Minions have been on this planet far longer than human being have. They go by many names, Dave, Bob, Terry (or is it Larry). For the first time ever, these adorable little freaks are headed to Orlando for Villain-Con. Their common goal is to serve the most despicable masters around. 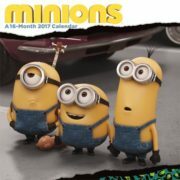 This is the 2017, 16 month mini wall calendar with animated art images from the hit Minion movie. Minions have been on this planet far longer than human being have. They go by many names, Dave, Bob, Terry (or is it Larry). Their common goal is to serve the most despicable masters around. 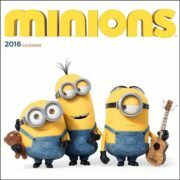 This is your one in a minion chance to start off 2017 on a right note with our Minions Wall Calendar. This is the 2017, 16 month wall calendar with animated art images from the hit Minion movie. Minions have been on this planet far longer than human being have. They go by many names, Dave, Bob, Terry (or is it Larry). Their common goal is to serve the most despicable masters around. 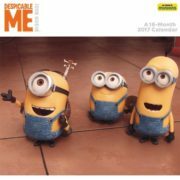 This is your one in a minion chance to start off 2017 on a right note with our Minions Wall Calendar. 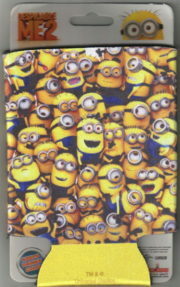 This is a 2.75″ wide cinch belt featuring the image of the Minion Tom beside the phrase “1 In A Minion” from the Despicable Me movies and the new Minion movie. Made from a heavy duty stretchable nylon, it has a sliding buckle with the image repeating for the entire length of the belt. It is available in two sizes: small/medium which is 28″ long unstretched and medium/large which is 35″ unstretched. 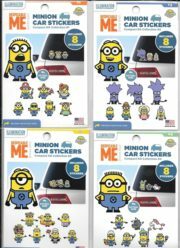 Produced in 2015 by Fun Stickers, this is four different sets of 8 different peel off vinyl car stickers in each package (though you can put them on anything with a smooth surface) that feature the images of various Minions from the Despicable Me movies and the new Minion movie. 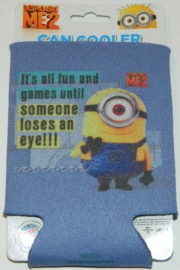 This is an illustrated, insulated, neoprene drink can cooler coozie huggie featuring the image the Minion Carl saying “It’s all fun and games until someone loses an eye!! !” from the hit animated movie Despicable Me 2. 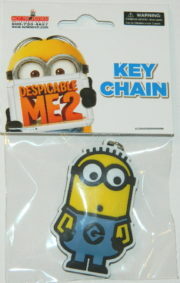 This is a licensed, 2.25″ x 1.75″ rubber keychain featuring the art image of Carl the minion from the cult hit movie Despicable Me 2. 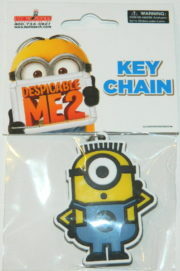 This is a licensed, 2.5″ x 1.5″ rubber keychain featuring the art image of Dave the minion from the cult hit movie Despicable Me 2. 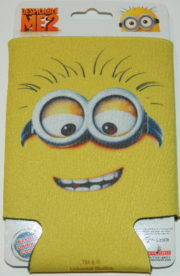 This is an illustrated, insulated, neoprene drink can cooler coozie huggie featuring the image Many Minions from the hit animated movie Despicable Me 2. 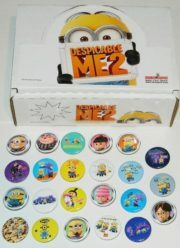 This is a licensed set of 100 1.25″ wide metal buttons featuring 23 different images from the Despicable Me 2 movie. This is a licensed set of 100 1.25″ wide metal buttons featuring 15 different images from the Despicable Me 2 movie. 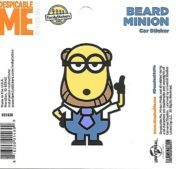 Produced by Hot Properties this is an air freshener featuring the art image of the minion Carl from the popular animated movie Despicable Me 2. 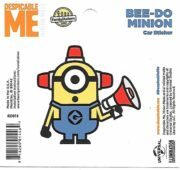 Produced by Hot Properties this is an air freshener featuring the art image of a group of three minions from the popular animated movie Despicable Me 2. 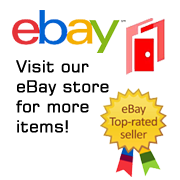 It measures 3.5″ x 3″ and sealed in the original shrink wrap with a strawberry scent. 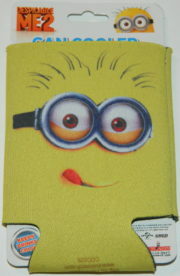 This is an illustrated, insulated, neoprene drink can cooler coozie huggie featuring the image of a Minion licking his lips from the hit animated movie Despicable Me 2. This is an illustrated, insulated, neoprene drink can cooler coozie huggie featuring the image of a smiling Minion from the hit animated movie Despicable Me 2. 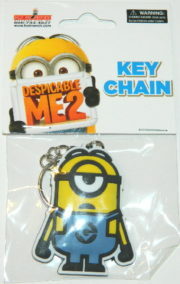 This is a licensed, 2.25″ x 1.75″ rubber keychain featuring the art image of Stuart the minion from the cult hit movie Despicable Me 2. 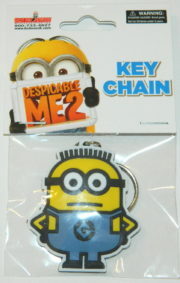 This is a licensed, 2.25″ x 2″ rubber keychain featuring the art image of Tom the minion from the cult hit movie Despicable Me 2. 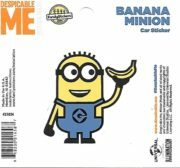 Produced in 2015 by Fun Stickers, this is one of 31 different peel off vinyl car stickers (though you can put them on anything with a smooth surface) that feature the images of various Minions and other characters from the Despicable Me movies and the new Minion movie.